My daughter’s horticulture class had a plant sale earlier this week. She brought home a lovely mix of Sweet Potato Vines and Coleus 🙂 This is the story of our first sweet potato vines! Plant Size: Short, but the vines can really spread out! I found one site saying Margarita spreads 48-60 inches (4-5 ft) and can trail up to 72 inches (6 ft). 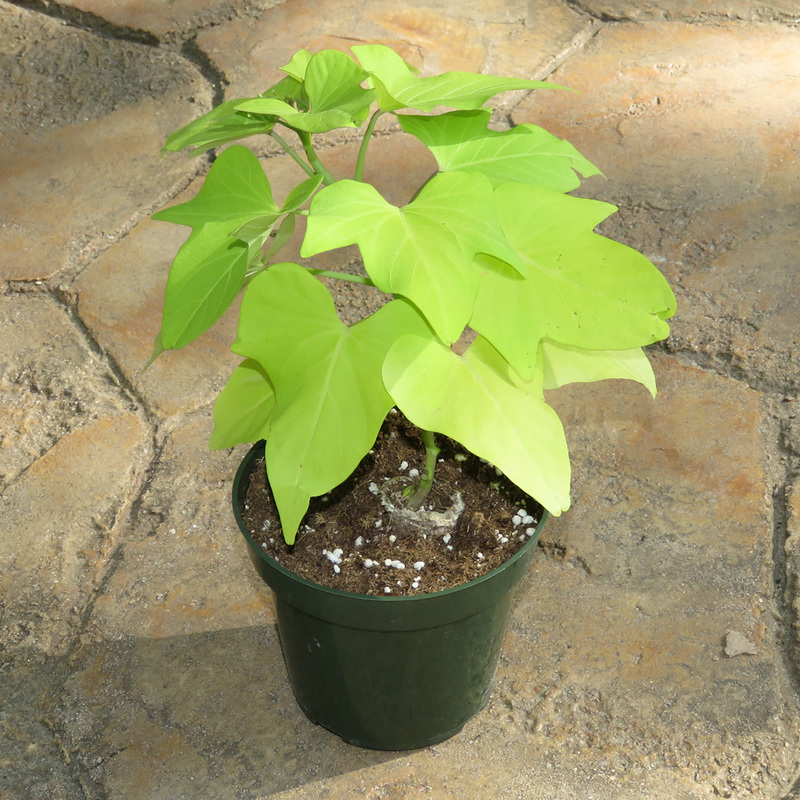 After doing some research, I think some sweet potato vines get even bigger than this! The colors! 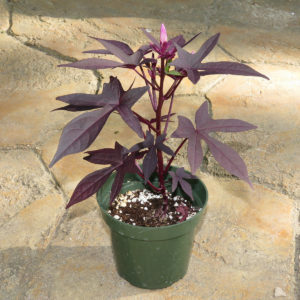 I once had a forgotten sweet potato sprout in my kitchen and the most beautiful purple/green striped vine trailed down the side of my fridge. I was in the process of looking for a house at the time and so looked forward to purposely growing one of these in my garden! For whatever reason, I haven’t gotten around to trying to sprout my own sweet potatoes again. … These look drastically different from what appeared in my kitchen all those years ago. But they are still beautiful! I can hardly wait to see these vines take over a small section of my yard. Beautiful pink/purple blooms started opening on this one the morning after we got it. The new blooms were already wilting by the end of the day. I am eager to see if they last longer once in a bigger container for proper hydration. The leaves on this vine are striking! Dark purple, with a beautiful dark green tint where the sun hits it just right. 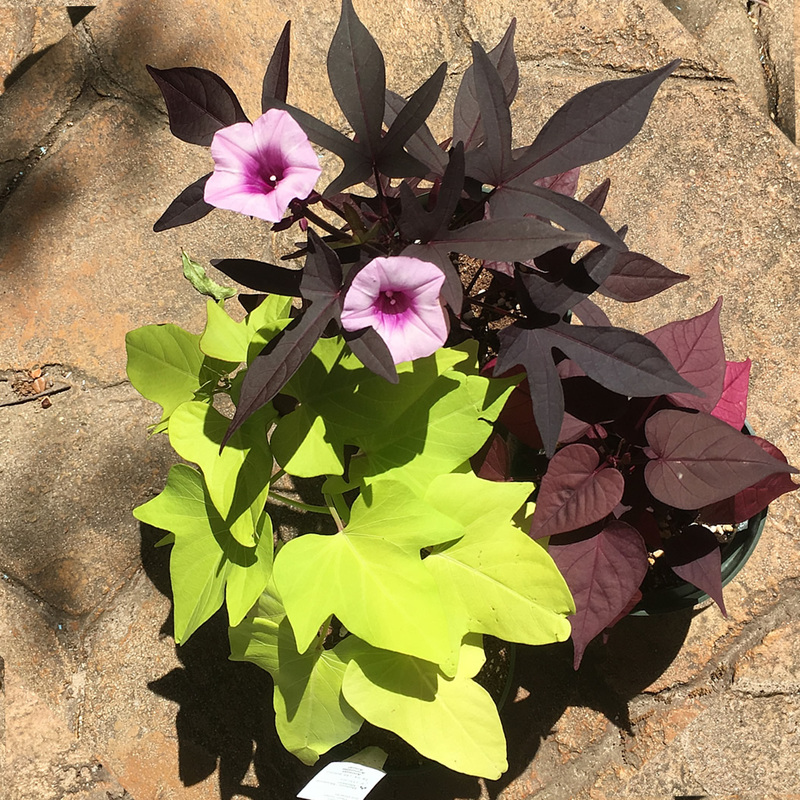 Still beautiful, but our Blackie Sweet Potato Vine is showing more green than I expected. I am curious what it will look like a couple of months from now, when the spot I chose for planting gets full sun. I love these cheerful bright green foliage on this one! 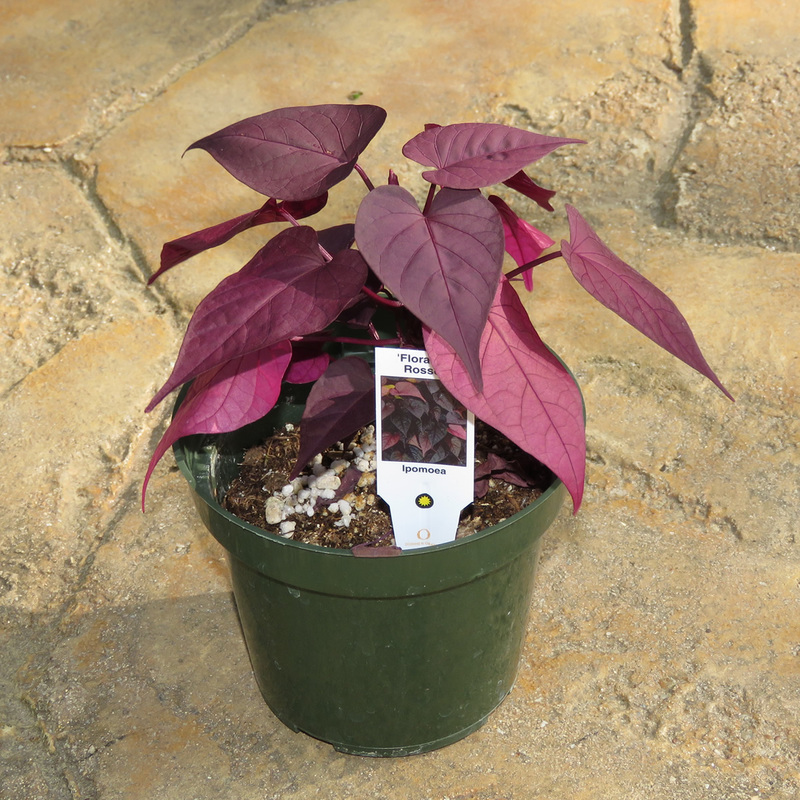 A wonderful contrast to brighten up the dark purples of Blackie and FloraMia Rosso. I just love this bright, cheerful green! I can hardly wait for it and the other vines to take off and trail down the planter! 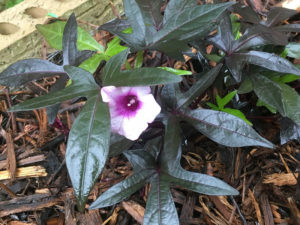 Yet another sweet potato vine variety. 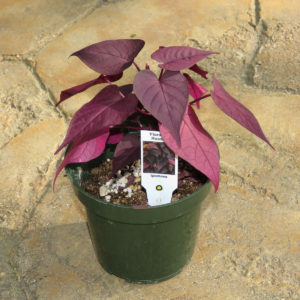 This lovely plant has a red tint to its dark purple, heart shaped leaves. 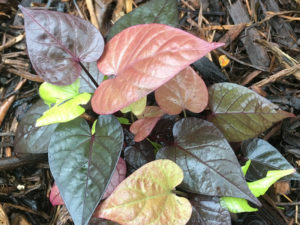 I have to admit, I do miss that lovely red color that the leaves had when we brought home this little vine. But I am impressed with the variety in color that our FloraMia Rossy has begun to display! 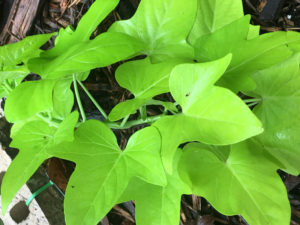 5/25/2018 Update: Something dug up our sweet potato vines! Something dug up all three of our sweet potato vines while we were out of town for Mother’s Day. We replanted and it looks like all three will survive. But none of them look near as pretty as they did before. In addition to the damage from being dug up, our Marguerite is full of holes. Some bug must be eating it at night. I will have to get some neem oil to see if that will keep the pests at bay.